Coin roll hunting is the process of searching through rolls of coins in order to find valuable coins. The easiest and most convenient way to get coin rolls is from banks. Once you search through the rolls you then deposit the non-valuable coins back at the bank. Junk silver coins are the easiest and most popular coins to look for. What is junk silver? It's United States coins that contain significant percentages of silver. 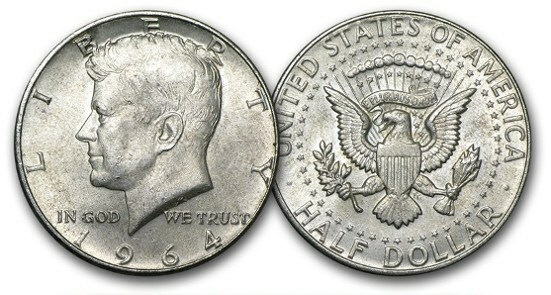 Dimes, quarters, and half-dollars minted before 1965 will be 90% silver. Half dollars from 1965-1970 will be 40% silver. Nickels minted from 1942-1945 are 35% silver and are known as war nickels. In addition to silver you can also search for valuable pennies. The older pennies such as the Indian head cent (1859-1909) and the wheat cent (1909-1958) are valued for their copper content as well as their numismatic value. Any penny minted before 1982 is 95% copper. It's not difficult to find copper pennies in a penny roll, although profits will not be high. With the current price of copper, the bullion value of a copper penny will be about two cents. Learn more about pennies in our copper penny guide. Another popular option is to search for error coins. Certain rare error coins can be worth thousands of dollars. But you really need to know what to look for so it helps if you are a coin expert or at least well-versed in some of the different error coins. Lastly you can look for commemorative coins. These are coins that you can add to your own personal collection. For example if you are collecting state quarters then you can search for ones that are missing from your coin collection. It's getting harder to find good coins as the amount of silver currently in circulation is decreasing. You can go through a bunch of rolls and not find any silver. If you search for error coins then it takes much longer to go through a roll. If you want to sell most or all of your coins, then you need to have at least one good buyer who will pay you at or slightly above spot price. So don't think of this as full-time job. At best it's a part-time job and that will depend on how good you are. It's best to think of it as a hobby that you can make some money on- just like with metal detecting. However it's possible that the price of silver could rise. Therefore this hobby could become more profitable in the future. But over the long term it's probably best to just buy silver from reputable dealers rather than spend a bunch of time searching through rolls. Getting started is simple enough, but you want to make sure you set up a proper system. You want it to be as time-efficient as possible. First you need to find the right banks. Find ones that don't charge you any fees related to coin roll hunting. You want to have two banks. The pickup bank is the one that you will order your coins from. This could be a regular order. 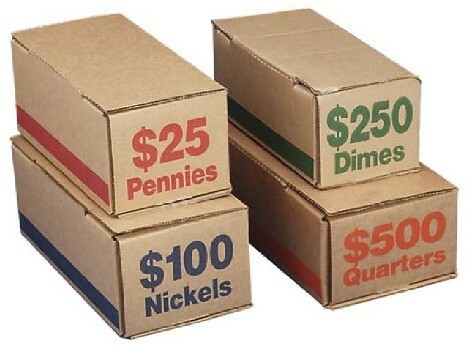 For example you could have a standing order of 5 boxes of half-dollars every week. Next you want to have a dump bank. The general rule is to never dump your coins at your pickup bank. You always want to keep them separate. Search through all the coins and keep the coins that are valuable, and then deposit the rest at your dump bank. You want a dump bank that will accept loose coins. It will just take too long to roll all the coins back up. One option is to find a bank with it's own automatic coin machine. It would be the same type of machine as Coinstar except you wouldn't have to pay a fee. Another option is to ask the bank manager if they will accept loose coins in plastic bags, the same ones that their courier uses. This can be the best option if you are doing a lot of volume. If you put in thousands of coins into a coin machine then it could jam up. The bags you deposit need to be accurate. If it's a $1000 bag of quarters then there needs to be exactly $1000 worth of quarters in the bag. So let's say you have boxes of quarters worth $1000 that you plan to search through. If you find two silver quarters then you need to replace those quarters with two regular clad quarters when it's time to put all the coins in the bag. This is a good system and you can repeat the process over and over again. Below you can find tips that will help improve your results. If you see a marked coin or an entire roll of marked coins then it's usually best to disregard them. Many collectors will leave a mark on coins in order to identify that those particular coins have been searched. Some people resent this practice so it remains controversial to mark your coins. On downside is that someone could unknowingly mark an error coin and thus decrease its value. Stamping a coin is legal in the United States under 18 USC Section 331. Stamping only becomes illegal if you are attempting to commit fraud with the coins. Customer wrapped rolls are better if you can find them. You will be able to find more silver coins and copper pennies in them. All you need to do is ask the bank teller if they have any customer wrapped rolls on hand. In addition, you can also ask the bank teller if there are any loose half-dollar coins. If so then take all of them- don't be picky. Ideally you want to find multiple banks to deposit your searched coins. That way you can rotate where you "dump" your coins. If you keep dumping your coins at the same branch then they might ask you to stop. If you are serious about this hobby then you will learn from experience and find a system that works well for you. It's important to have your banks close to where you live or where you work. Ideally you want to drive by them on a regular basis. Therefore you aren't driving out of your way to coin hunt. This hobby should cost you in time only. Write down your results in a journal, and then add them to a spreadsheet on your computer to tally up the total value of your finds. You can also take pictures of your best finds. If you're really interested in this hobby then it's a good idea to join a coin roll hunting community. The TreasureNet Forum is one of the most active communities where you can learn the latest tips and strategies. People also post pictures of their most recent finds. You can have a lot of fun coin roll hunting and it can even be thrilling at times. But don't expect to make a lot of money from it. It's getting harder as more valuable coins are getting out of circulation.